Designing an emblem to unite the workers of immigration rights. 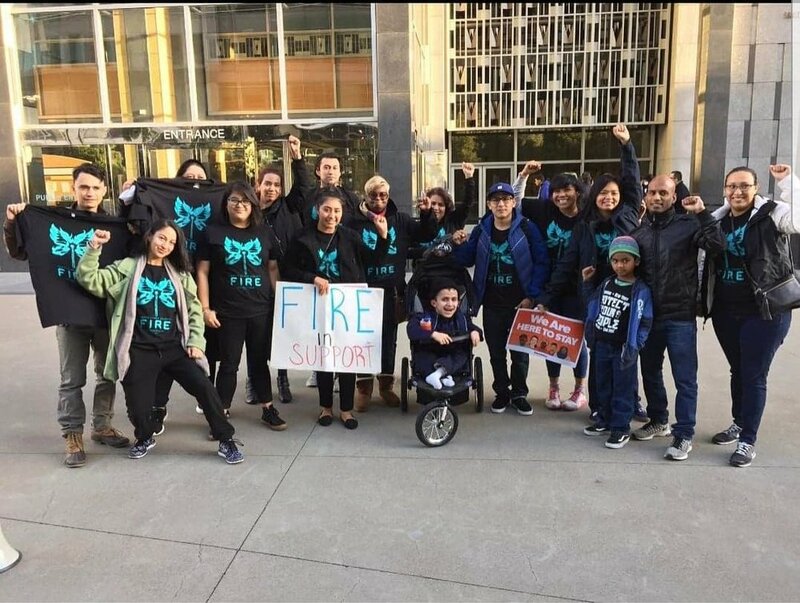 Silicon Valley De-Bug, one of 6 groups in the Santa Clara FIRE Coalition dressed in unity. Design an emblem that would be screen printed on a T-shirt and worn in a protest against Trump’s attack on sanctuary cities. January 25th, 2017, marks Trump’s third attempt to pass an Executive Order to withhold funding to Sanctuary Cities across the nation. The Santa Clara F.I.R.E Coalition, a partnership between Silicon Valley De-Bug, SIREN, Asian Law Alliance, Pangea Legal Services, Community Legal Services in East Palo Alto, and the Stanford Law School’s Immigrants’ Rights Clinic filed an amicus brief that outlines a civil policy detainer to strike down the executive order. The collective efforts of this coalition needed to be united through an emblem where members could wear during the amicus brief hearing that would determine the fate of undocumented people. United by the emblem, the coalition showed up in full force to rally for the passing of the amicus. On April 25th, 2017, US District Judge William Orrick III’s latest ruled in favor of the amicus and terminated the Executive Order. Click to read more on the Amicus Brief. 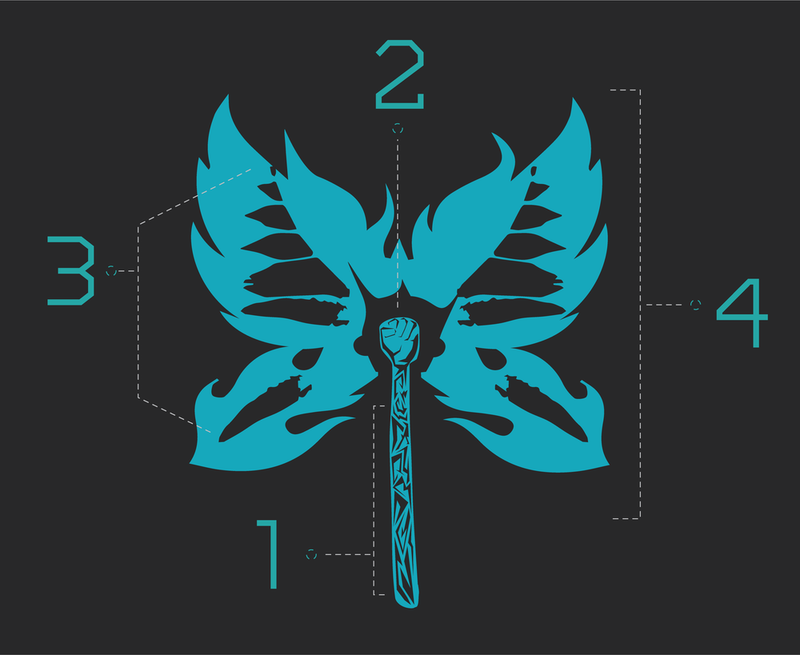 The body of the butterfly is a match stick as well as the iconic power salute of solidarity. The stick is carved to represent the movement work done by the hands of the community and those who are affected. The carving on the matchstick creates a similar visualization of carving on a trunk of a tree to imprint a lasting memory. As a representation of the power salute, the markings represent the scars that one holds inside and and out from fighting for their community and the scars of those affected from the hate and abuse received from being seen as lesser than human because of their status. The match head designed as a raised fist from a power salute represents unity and solidarity. Striking together in solidarity ignites change just as when you strike a match, it ignites a fire. Butterflies are iconic for their markings and shape. 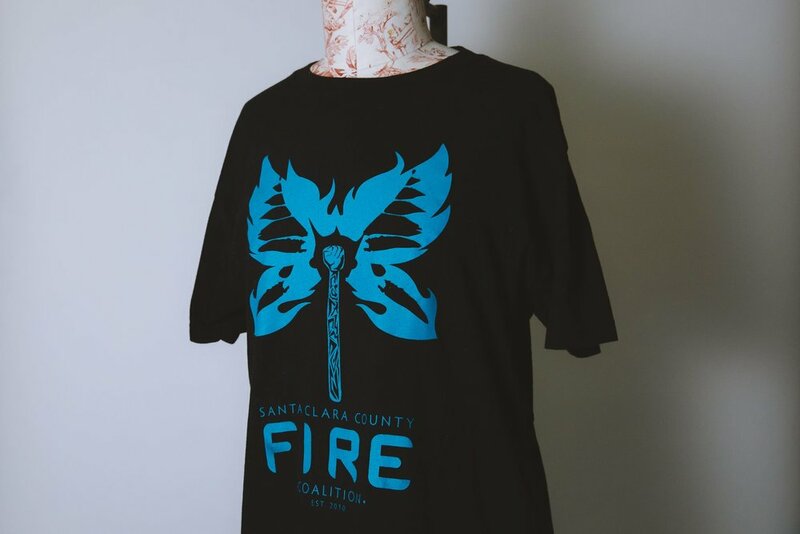 Markings of the butterfly are used as an element to represent the flickering of a burning fire when in contact with air. The air in contact represents the breath from our voices demanding justice. The flame that is ignited by the power salute is a flame in the form of a butterfly. Butterflies, specifically monarch butterflies are the symbolic representation of immigration and migration. This is a representation of solidarity for immigration rights and empowerment. The color used is an iconic color of San José in Santa Clara County which is a home and a sanctuary city to a vibrant immigrant community. The choice of color used is also in the family of blues which is the intrinsic color of water and ice. This emblem tells a story that even when attacked by U.S. Immigration and Customs Enforcement (ICE), the solidarity and resilience of immigrants and those who are undocumented still burn through.